Seamless toe Albahealth Care Sox represents a huge leap forward in the development of socks that enhance comfort even as they allow for better circulation. Designed by an RN who cared for patients with insufficient circulation, these all-cotton non-compression socks are oversized to accommodate patients suffering from edema brought on by diabetes or circulatory problems. With their seamless toe and generous proportions, Care Sox enable patients and health-care professionals alike to take advantage of their non-binding comfort while providing a broad range of benefits. Specially recommended for anyone who suffers from swollen feet, circulatory or diabetic problems. Made of 100% natural cotton with excellent absorbency. Perfect for use with medicinal or softening creams. Sizes:M/L- Women 5-10, Men 4-9. L/XL- Women 10 and up, Men 10-12 1/2. 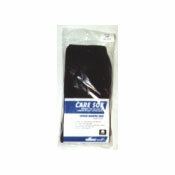 Contains an anti-microbial agent to guard against sock odors. Cut extra wide and extra deep to help prevent binding. Sized large enough to fit over cast.